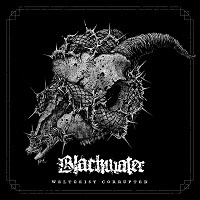 BLACKWATER started back in 2008. In 2012 they released an EP “Founded on the Shambles”, which was some kind of modern maybe Technical Death Metal. With “Weltgeist Corrupted” Fabian says “We tried to focus on the core of the song itself, using technical skills only to serve the purpose of each song-trying to be more straight forward, blending Death, Black and Grind”. Since then they have had to struggle with lots of line-up changes. Right now Fabian is the only founding member left. Fabian also told me; “We recorded the album at Blastbeat Productions with Oliver Carell in our hometown Kiel. It was mixed in Leipzig by Andy Schmidt, mainly known for his work with Disillusion. “Free From Sin” is probably the hardest hitting song of the album. This really flexes the band’s muscles. There is a more Death Metal feel to it, a uncut blend of technical melody that you usually expect to hear from the likes of Suffocation. Fabian once again shows he can match his band mates with whatever they throw at him. His brutality really kicks into overdrive on this song, he holds all the screams perfectly. This is without a doubt the best song of the album.